OMG! Lovely picture and very apocalyptic. That sunset back there resembles a nuclear mushroom cloud! this should be in a meusium somewhere, after they try to get the graffiti off of it. 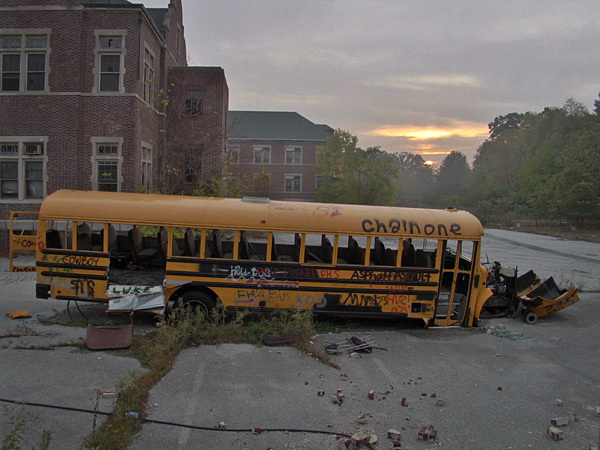 There were no school busses like this one at Pennhurst-where it came from who can say. Are there actually any former employees from Pennhurst -besides myself-on this site? Just like Devon Hall--you mean D Building? The buildings may all have had formal names-but were never used. samantha -- the bus, im guessing, was just left there when pennhurst was closed. over the years the scrappers and vandals did their thing until it wound up looking like a squashed bug. one day in 2008 it just disappered. i believe the scrappers came and towed it away. why is there a bus all messed up here?? y didnt they like take it to a junk yard?